In the sixth month, the angel Gabriel was sent from God to a town of Galilee called Nazareth, to a virgin betrothed to a man named Joseph, of the house of David, and the virgin’s name was Mary. And coming to her, he said, “Hail, full of grace! The Lord is with you.” But she was greatly troubled at what was said and pondered what sort of greeting this might be. Then the angel said to her, “Do not be afraid, Mary, for you have found favor with God. Behold, you will conceive in your womb and bear a son, and you shall name him Jesus. He will be great and will be called Son of the Most High, and the Lord God will give him the throne of David his father, and he will rule over the house of Jacob forever, and of his kingdom there will be no end.” But Mary said to the angel, “How can this be, since I have no relations with a man?” And the angel said to her in reply, “The Holy Spirit will come upon you, and the power of the Most High will overshadow you. Therefore the child to be born will be called holy, the Son of God. And behold, Elizabeth, your relative, has also conceived a son in her old age, and this is the sixth month for her who was called barren; for nothing is impossible for God.” Mary said, “Behold, I am the handmaid of the Lord. May it be done to me according to your word.” Then the angel departed from her. The Incarnation takes place in Mary’s womb; the greatest event of history occurs at the Annunciation. The angel greets Mary with superlatives and indicates her primary role as Mother of the Messiah! At this moment the Holy Spirit verifies Mary as His “spouse” and that no human father will be the agent of conception. Mary’s generous response sets the tone of her whole life with Jesus. She is the first and best Christian, our example of giving an unqualified “yes” without knowing the future. During those days Mary set out and traveled to the hill country in haste to a town of Judah, where she entered the house of Zechariah and greeted Elizabeth. When Elizabeth heard Mary’s greeting, the infant leaped in her womb, and Elizabeth, filled with the Holy Spirit, cried out in a loud voice and said, “Most blessed are you among women, and blessed is the fruit of your womb. And how does this happen to me, that the mother of my Lord should come to me? For at the moment the sound of your greeting reached my ears, the infant in my womb leaped for joy. Blessed are you who believed that what was spoken to you by the Lord would be fulfilled.” And Mary said: My soul proclaims the greatness of the Lord; my spirit rejoices in God my savior. For he has looked upon his handmaid’s lowliness; behold, from now on will all ages call me blessed. The Mighty One has done great things for me, and holy is his name. His mercy is from age to age to those who fear him. He has shown might with his arm, dispersed the arrogant of mind and heart. He has thrown down the rulers from their thrones but lifted up the lowly. The hungry he has filled with good things; the rich he has sent away empty. He has helped Israel his servant, remembering his mercy, according to his promise to our fathers, to Abraham and to his descendants forever. Mary remained with her about three months and then returned to her home. Now this is how the birth of Jesus Christ came about. When his mother Mary was betrothed to Joseph, but before they lived together, she was found with child through the Holy Spirit. Joseph her husband, since he was a righteous man, yet unwilling to expose her to shame, decided to divorce her quietly. Such was his intention when, behold, the angel of the Lord appeared to him in a dream and said, “Joseph, son of David, do not be afraid to take Mary your wife into your home. For it is through the Holy Spirit that this child has been conceived in her. She will bear a son and you are to name him Jesus, because he will save his people from their sins.” All this took place to fulfill what the Lord had said through the prophet: Behold, the virgin shall be with child and bear a son, and they shall name him “Emmanuel,” which means “God is with us.” When Joseph awoke, he did as the angel of the Lord had commanded him and took his wife into his home. He had no relations with her until she bore a son, and he named him Jesus. When the days were completed for their purification according to the law of Moses, they took him up to Jerusalem to present him to the Lord, just as it is written in the law of the Lord, “Every male that opens the womb shall be consecrated to the Lord,” and to offer the sacrifice of “a pair of turtledoves or two young pigeons,” in accordance with the dictate in the law of the Lord. Now there was a man in Jerusalem whose name was Simeon. This man was righteous and devout, awaiting the consolation of Israel, and the Holy Spirit was upon him. It had been revealed to him by the Holy Spirit that he should not see death before he had seen the Messiah of the Lord. He came in the Spirit into the temple; and when the parents brought in the child Jesus to perform the custom of the law in regard to him, he took him into his arms and blessed God, saying: Now, Master, you may let your servant go in peace, according to your word, for my eyes have seen your salvation, which you prepared in sight of all the peoples, a light for revelation to the Gentiles, and glory for your people Israel. The child’s father and mother were amazed at what was said about him; and Simeon blessed them and said to Mary his mother, “Behold, this child is destined for the fall and rise of many in Israel, and to be a sign that will be contradicted (and you yourself a sword will pierce) so that the thoughts of many hearts may be revealed.” There was also a prophetess, Anna, the daughter of Phanuel, of the tribe of Asher. She was advanced in years, having lived seven years with her husband after her marriage, and then as a widow until she was eighty-four. She never left the temple, but worshiped night and day with fasting and prayer. And coming forward at that very time, she gave thanks to God and spoke about the child to all who were awaiting the redemption of Jerusalem. When they had fulfilled all the prescriptions of the law of the Lord, they returned to Galilee, to their own town of Nazareth. The child grew and became strong, filled with wisdom; and the favor of God was upon him. Each year his parents went to Jerusalem for the feast of Passover, and when he was twelve years old, they went up according to festival custom. After they had completed its days, as they were returning, the boy Jesus remained behind in Jerusalem, but his parents did not know it. Thinking that he was in the caravan, they journeyed for a day and looked for him among their relatives and acquaintances, but not finding him, they returned to Jerusalem to look for him. After three days they found him in the temple, sitting in the midst of the teachers, listening to them and asking them questions, and all who heard him were astounded at his understanding and his answers. When his parents saw him, they were astonished, and his mother said to him, “Son, why have you done this to us? Your father and I have been looking for you with great anxiety.” And he said to them, “Why were you looking for me? Did you not know that I must be in my Father’s house?” But they did not understand what he said to them. He went down with them and came to Nazareth, and was obedient to them; and his mother kept all these things in her heart. And Jesus advanced in wisdom and age and favor before God and man. Three times in the Infancy Narrative of Luke, Mary is said to reflect on the events in Jesus’ life: the Nativity, the Presentation, the Finding in the Temple. Mary is presented to us as the model of the Church’s prayer life, and of living by the instruction of Jesus. After the pattern of Mary the Church reflects on her Head and cherishes what Jesus said and did. After His being found in the Temple, Jesus is said to grow in wisdom and grace and age. It is obvious that Mary also grew spiritually throughout her life. No doubt Mary taught her Son how to be a more effective person on the human level, how to relate with women in His ministry, how to express feelings of mercy and tenderness and compassion. Jesus in turn taught her as His chief disciple how to understand the Jewish Testament about His own life’s work, so that she was fully prepared to surrender her mother’s rights, “let go” of Him, and even enter the mystery of the passion at His side. Thus God involved Mary in His design, His “secret plan” hidden for ages, but revealed in Christ in the fullness of time. We, too, are called to search out God’s plan and Mary’s share in that mystery of salvation. We do not choose her as mother or queen; God has already chosen her. We are simply the beneficiaries of the gift of Mary’s presence in the Church and in individual souls. By our total consecration, what begins in our lives as obedience to God’s inspiration ends with joy and peace that we have made such a commitment! 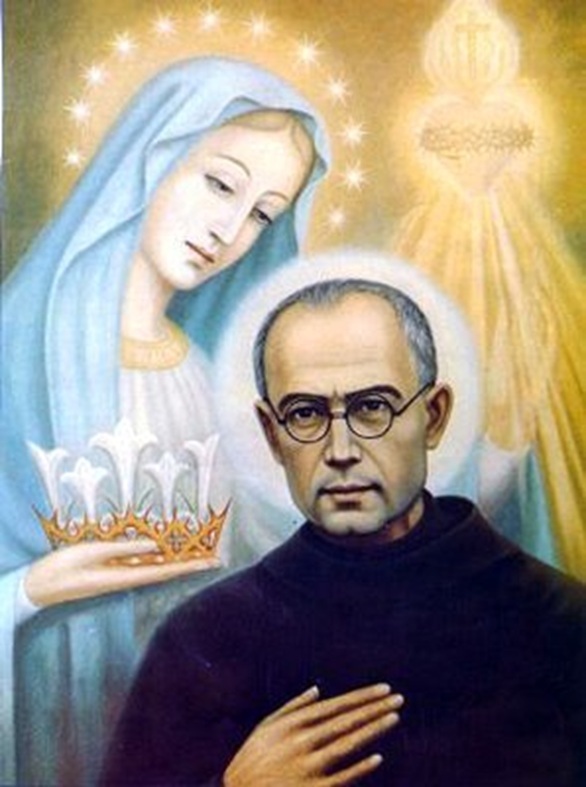 You are hers, so let yourself be guided by the Immaculata. Then the Lord God said to the serpent: Because you have done this, you shall be banned from all the animals and from all the wild creatures; On your belly shall you crawl, and dirt shall you eat all the days of your life. I will put enmity between you and the woman, and between your offspring and hers; He will strike at your head, while you strike at his heel. To the woman he said: I will intensify the pangs of your childbearing; in pain shall you bring forth children. Yet your urge shall be for your husband, and he shall be your master. To the man he said: Because you listened to your wife and ate from the tree of which I had forbidden you to eat, Cursed be the ground because of you! In toil shall you eat its yield all the days of your life. Thorns and thistles shall it bring forth to you, as you eat of the plants of the field. By the sweat of your face shall you get bread to eat, Until you return to the ground, from which you were taken; For you are dirt, and to dirt you shall return. The man called his wife Eve, because she became the mother of all the living. When the soldiers had crucified Jesus, they took his clothes and divided them into four shares, a share for each soldier. They also took his tunic, but the tunic was seamless, woven in one piece from the top down. So they said to one another, “Let’s not tear it, but cast lots for it to see whose it will be,” in order that the passage of scripture might be fulfilled (that says): They divided my garments among them, and for my vesture they cast lots. This is what the soldiers did. Standing by the cross of Jesus were his mother and his mother’s sister, Mary the wife of Clopas, and Mary of Magdala. When Jesus saw his mother and the disciple there whom he loved, he said to his mother, Woman, behold, your son. Then he said to the disciple, Behold, your mother. And from that hour the disciple took her into his home. After this, aware that everything was now finished, in order that the scripture might be fulfilled, Jesus said, I thirst.